Scenic Eclipse cruisers can venture above the horizon. Scenic Eclipse, the World’s First Discovery Yachts, is redefining the standard of ocean cruising, setting new benchmarks in design, innovation and luxury. This week sees the rollout of the company’s state-of-the-art Airbus H130 helicopters, which will provide Scenic Eclipse guests with unparalleled access to some of nature’s most beautiful sites. 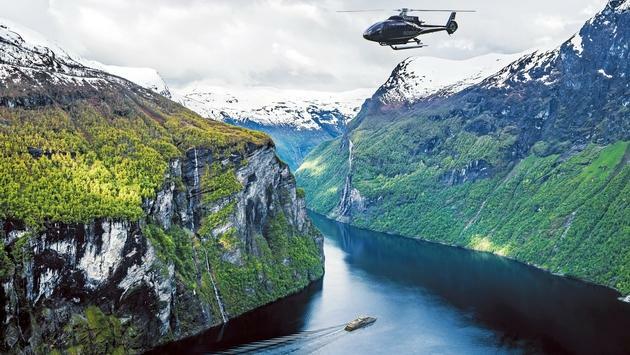 As one of the quietest helicopters in the skies, the H130 sets the standard for tourism operations worldwide. Its reduced sound levels are seven decibels below the International Civil Aviation Organization (ICAO) requirement and are quieter than the most restrictive sound limits defined for flights over national parks, animal and nature reserves across the world. The H130 is also one of the most environmentally friendly helicopters on the market with an efficient fuel burn that ensures lower emissions and less fuel usage. Scenic Founder and Chairman, Glen Moroney, said the two helicopters on board Scenic Eclipse will offer guests a unique opportunity to go above and beyond. Specific modifications have been made to the H130 to ensure it meets the requirements of Scenic in terms of safety and guest comfort. These include Bose noise canceling headsets; five cameras fitted to the interior and exterior of the helicopter to provide guests with footage of their flight; custom leather seats and interior fit-out; and a blue tooth audio system allowing music to be piped to guests. As the H130 has been designed to be carried on board the Scenic Eclipse, it has been fitted with a quick rotor blade fold kit to allow the ship to have a smaller hangar than is usually required. Keeping with their Australian roots, the Scenic Eclipse helicopters were commissioned from Airbus in France before being shipped to Australia’s Pacific Crown Helicopters for final fit out and testing. Pacific Crown Helicopters specializes in Airbus helicopters and is a recognized world leader in the field. Scenic Luxury Cruises & Tours has grown over its 31-year history to include award-winning, all-inclusive escorted tours that take participants to many of the world’s most fascinating destinations; two award-winning river cruise lines—Scenic and Emerald Waterways; and, launching January 2019, the world’s first Discovery Yacht—Scenic Eclipse. Emerald Waterways’ seven Star Ships offer deluxe cruises in Europe, and the Mekong, while Scenic’s 15 Space Ships offer truly all-inclusive, five-star river cruises in the same destinations as well as the Irrawaddy River in Myanmar. Additional information on these and other cruises, brochures and reservations can be obtained via travel agents; or in the US: scenicusa.com; phone 844-788-7985; or email: info@scenicusa.com: and in Canada: scenic.ca; phone (866) 689-8611; or email: canada@scenic.ca. Brochures can also be downloaded directly from the website.